I've enjoyed several of Neal Stephenson's books, but find many of them far too long, suffering from bestselling author bloatitis, so I thought it would be interesting to get hold of a copy of his classic, Snow Crash - and I'm very glad I did. Although not a pastiche, it depends heavily on four classics of science fiction. The obvious one is William Gibson's Neuromancer, because of the net-based cyberpunk aspects that are central to Snow Crash. (The snow crash of the title is nothing to do with skiing and everything to do with computers crashing.) However, the pace and glitteriness owes a huge amount to Alfred Bester's Tiger Tiger (that's the UK title - it was originally The Stars my Destination), while the corporate-run world has a distinct feel of Pohl and Kornbluth's Gladiator at Law, though interestingly here it's a world without any laws whatsoever. And finally there's a touch of Samuel Delaney's Babel-17, where a language is capable of doing more than simply describe things. In Delaney's book, the language is so specific that if you name something, you can construct it given only that name - here, language is capable of re-programming the human brain. These influences, though, are only for those who are interested. If you like the kind of science fiction that hits you between the eyes and flings you into a high-octane cyber-world, particularly if you have an IT background, this is a masterpiece. Once you get over the odd name of the hero/protagonist (he's called Hiro Protagonist. Really) it is a joy to read. And despite being over two decades old, the technology really doesn't grate. Okay, Stephenson set it too early for the level of virtual reality capability, and there are too many references to video tapes, but otherwise it could have been written yesterday. What's particularly remarkable is that it is all about the internet (if not named as such) at a time when the internet wasn't widely known. This was written in 1992, yet when Microsoft launched Windows 95, it wasn't considered necessary to give any thought to the internet. That's how quickly things have changed. As you might expect from Stephenson, there are some dramatic set-piece fights and rather a lot of violence, virtual and actual, but it also features erudite and quite lengthy library exposition of the precursor myths to many modern religions and some mind-boggling (if far-fetched) ideas about language, the nature of the Babel event and of speaking in tongues. There's also a strong female character, though today's readers might raise an eyebrow about a relationship between a 15-year-old girl and a thirty-something mass murderer. Oh, and I love the rat things. If you find some of Stephenson's more recent books overblown, this is the one to go back to. Nicely done indeed. 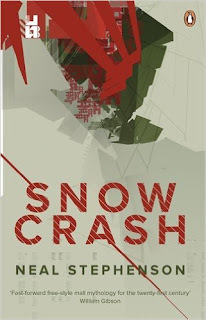 Snow Crash is available from amazon.co.uk and amazon.com. Rant warning: the contents of this post could sound like something produced by UKIP. I wish to make it clear that I do not in any way support or endorse that political party. In fact it gives me the creeps. Once upon a time, the signs for a steep hill on British roads displayed the gradient in a simple, easy-to-understand form. If the hill went up, say, one yard for every three yards forward it said '1 in 3'. Then some bureaucrat came along and decided that it would be a good idea to state the slope as a percentage. So now the sign for (say) a 1 in 10 slope says 10% (I think). If I'm honest, the title of this post is an exaggeration to make a point. I don't really hate opera. There are a couple of operas - notably Monteverdi's Incoranazione di Poppea and Purcell's Dido & Aeneas - that I quite like. But what I do find truly sickening is the reverence with which opera is treated, as if it were some particularly great art form. Nowhere was this more obvious than in ITV's recent gut-wrenchingly awful series Pop Star to Opera Star, where the likes of Alan Tichmarsh treated the real opera singers as if they were fragile pieces on Antiques Roadshow, and the music as if it were a gift of the gods. For some time I've been using an Apple Airport Express to relay music from my computer to another room to plug into an old fashioned sound system that hasn't heard of Wifi. The setup works well, but it's overkill as the Aiport is a fairly expensive piece of kit that can do far more. 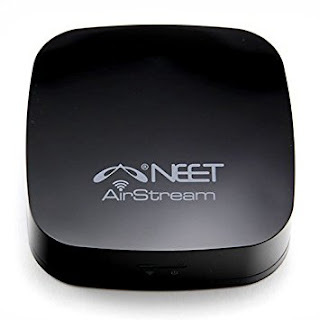 I needed to redeploy the Airport Express for a more heavy duty use, so I looked for a good, low priced alternative to do the job - and settled on the Neet Airstream. It's a little black puck, squarish with rounded corners. It feels fairly lightweight, but seems reasonably well made. The setup process was not brilliantly described in the manual, but is reasonably straightforward, and once it was up and running it simply appeared as an AirPlay device available to computers or phones via the Wifi. The sound seems fine - I'm very happy.